Got extra gin lying around? Got extra cucumbers lying around? We did, and that's exactly what caused us to make these delicious summertime beverages. Cool and refreshing, the cucumber adds a very fresh taste to this cocktail. 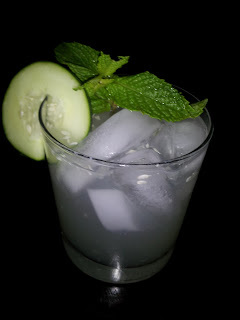 So, to start with, you need: cucumber, mint, club soda, gin, simple syrup (don't know how to make that? I'll share later, perhaps), and lemons. Better if you have a Collins glass, but if not, you can use a rocks/old fashioned glass like I have shown at left. Start by muddling a generous amount of sliced cucumber with one jigger of simple syrup and one of lemon juice in the bottom of a shaker. To get more cucumber flavor, you should really pulverize the slices. I like cutting the circles in half first to allow more of the seeds and cucumber to break off easier. Add 2 jiggers of gin to the shaker and fill with ice. Shake vigorously until cold. Here you've got an option: If you want substantial amounts of cucumber in your beverage, pour it unstrained into a glass about 2/3 full. If you just want the flavor and don't want the cucumber pieces (my preferred way), strain it into a glass over ice up to about 2/3 full. Fill the remaining 1/3 of the glass with club soda. Important step: Dump the entire thing into a larger glass and back to mix the soda into the drink. Garnish with mint sprig and an extra slice of cucumber and enjoy.